Kurt Terrio and his associates at Midtown Arts Center in Fort Collins are on a roll. Like the “Les Miserables” composers, however, they are not ready to rest on their laurels! Within the past year or so they have thrilled audiences with “Shrek,” “Monty Python’s Spamalot,” and their cast of “Les Miserables” received a standing ovation at this year’s Henry awards, sponsored by the Colorado Theater Guild. The show was nominated for Best Musical. It did not win but did win the hearts of the entire audience with the cast’s exciting presentation at the awards show. 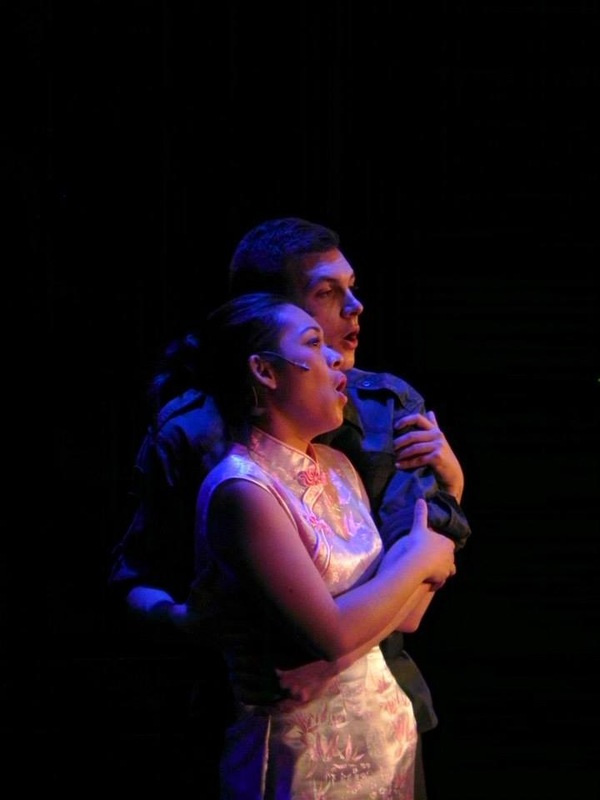 Based on past success and audience enthusiasm, they have turned their talents to producing a particularly demanding “Miss Saigon.” The show running through November 22, 2014, just might be among the most memorable in recent history! The Vietnam War concluded with the fall of Saigon in 1975. The solemn situation was remembered by the news media recently, with focus on the heart-wrenching memories of the helicopter landing on the roof of the American Embassy, trying to airlift as many persons as possible to safety before Saigon totally collapsed. 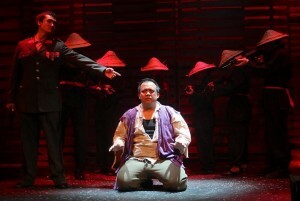 “Miss Saigon,” the musical version of these tragic times is not for the weak of heart. Potential patrons should be warned that some of the early scenes in the Saigon prostitution bar are incredibly well portrayed and quite provocative. The audience is rewarded with one of Broadway’s most memorable shows. Tears flowed freely, as the talented cast lead the audience through this story of incredible love and overwhelming loss. 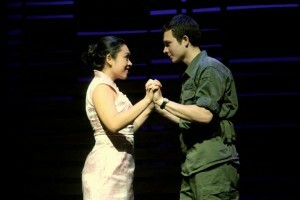 Jay Paranada as the Engineer, Nigel Huckle as a soldier Chris, and Lora Nicolas as Kim, a young Vietnamese girl head the flawless cast. The Engineer is a smarmy entrepreneur who sees everything in life in regards to how much money can be made! Chris is a disillusioned soldier, horrified by what is going on around him, and initially eager to leave it all behind. Kim has lost both her parents in the war. She turns up terrified at the Engineer’s club as her only way to survive is to become a prostitute. A soldier friend of Chris virtually forces Chris to look after the new girl in the club and the two fall in love. I would be hard-pressed to find three leading players with more exciting voices than Lora Nicholas, Jay Paranada, and Nigel Huckle. Huckle was excellent as Marius in Midtown’s “Les Miserables,” but that role did not showcase his talents as well as “Miss Saigon.” He is an awesome performer! Whereas Nicolas, Paranada and Huckle are the show’s stars, they share the stage with very talented supporting players. Anne Terze-Schwarz is convincing as Ellen Scott, the woman that Chris eventually marries, Taamu Wuya plays John Thomas, the soldier friend of Chris who encourages Kim and Chris to get together. His voice, especially in the second act, is nothing short of thrilling. Also excellent is Vahn Phollurxa, a Vietnam officer who is also in love with Kim. He can be incredibly evil one moment, and tormentingly tender the next. The set, designed by Felipe Avalos, is excellent, as is the the vocal direction provided by Jalyn Courtenay Webb. Michael Lasris’ choreography is brilliant and haunting. The entire show has been directed and produced by Kurt Terrio, with Julia Smith as associate director. Costumes are by Steven Ross, Anne Terze-Schwarz, Julia Smith and Jalyn Webb. Carpentry by Sean Robbins and Clayton Doney, with scenic painting and properties by Joel Adam Chavez. The entire production looks and sounds brilliant! Orchestra is conducted by Casey Cropp and includes Larry Bridges, Larry Currey, Andy Krupp, Dave Lunn, Sonja Daggett, Jordan Wambeke, and Dan Morris. 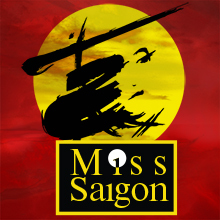 “Miss Saigon” is not a happy show, but one that leaves the audience touched by what transpires, and impressed with the total musical, visual, and historical experience!